Children of the horsegod Hak, the Peshwah believe they are a chosen people. Birthed to protect Hak's sacred lands and guide Hak's sacred horses, they are brothers and sisters of his divine spirit, and feel they hold a particular destiny and a special place in this, their land. From the rocky peaks of the High Hak to the dusty floor of the Valley of the Anceints, the tribes of the Peshwah roam. Horseman, nomad, prophet, merchant, warrior... each is a face of the Peshwah. 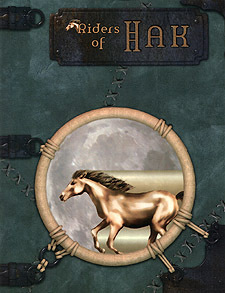 Welcome to Riders of Hak, the definitive sourcebook on the Peshwah for Dave Arneson's Blackmoor. Within this book, you will find everything needed to expand upon the presence of the Peshwah people in the lands of Blackmoor, or even to introduce the horsemen and their ways into another game setting. Requires the use of the Dungeons & Dragons Player's Handbook. This product uses material from the v.3.5 revision.